Andrew Gazdecki is the founder and CEO of Bizness Apps. Startup ecosystems are taking root across the country — Utah, Seattle, Dallas, Denver, Chicago, New York City — and they’re all looking to copy the formula Silicon Valley made so successful. According to SSTI, venture capital seems to be flowing across the entire country, with New York seeing $4.4 billion invested, Colorado $800 million, Georgia $836 million, Arizona $113 million, Delaware $98 million, Nevada $45 million, Ohio $300 million, Illinois $1 billion, Idaho $2 million, Kansas $50 million, Indiana $54 million, Florida $864 million, Connecticut $563 million… the list goes on. While these startup ecosystems are growing, nothing compares to Silicon Valley, which saw a whopping $27.2 billion, accounting for 47 percent of total venture capital invested into companies. Still, there are many benefits to growing a business outside of Silicon Valley: less competition for talent, more of an opportunity to establish oneself and one’s business and fewer billion-dollar titans overshadowing everyone. Cultivating the next Apple, Google or Facebook can create thousands of technology-related jobs, which would have a huge impact on any local economy in a short time. However, without the proper resources from investors and technology mentors, it is no easy feat. Investors prefer to invest locally. It is also easier and cheaper for promising entrepreneurs to pitch their ideas to investors, and for investors to co-invest, when they are local. Considering that 300+ VC firms call the Bay Area home, along with thousands of active angel investors, startups outside of Silicon Valley are at a disadvantage when it comes to raising capital. You don’t need to be in Silicon Valley to reap the benefits of what it has to offer. None of this means Silicon Valley is the only place a startup can succeed. Nor does it mean every company seeking engineering talent and venture capital needs to pick up and move to Silicon Valley. That simply isn’t feasible. What it does mean is that areas need to take a new approach to attracting venture capital and investor expertise to their city to help fuel their startup ecosystem’s growth. 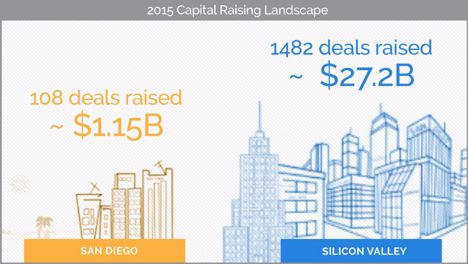 San Diego, for example, has tried, and succeeded, in attracting venture capital to their city. They’ve gotten an infusion of $1.15 billion invested into their economy, much of it to their booming biotechnology sector. But is this a positive sign for San Diego? Absolutely! That $1.15 billion investment is a massive amount, but it accounts for only 2 percent of the total venture capital investments being made nationwide. San Diego has realized this disproportion of investment into their city (comparative to the Bay Area) and is pioneering a new strategy to work with Silicon Valley to grow. Ultimately, the key to growth for budding tech cities across the nation is to find a way to bridge the gap between their technology companies and Silicon Valley’s resources. Bridging the gap to Silicon Valley has become a priority to many venture capitalists who see the potential in other cities. The possibility for added growth and innovation is becoming increasingly apparent to many. Thus, satellite offices are beginning to pop up in the nation’s technology hub. Many see this as the ideal solution to bridging the gap. By creating a satellite office, a sort of “bridge” between your city’s startups and Silicon Valley, you can have the best of both worlds. You get the (almost certainly) lower operating costs of your city, and your “bridge” provides the presence in Silicon Valley from which companies can benefit. Mike Krenn of the San Diego Venture Group is pioneering this new approach of helping companies in San Diego better connect with investors in Silicon Valley. They’re building a San Diego Business Hub in the Valley for Southern California startups to gain access to the investment capital Silicon Valley provides, without having to uproot their company. Other cities should consider doing the same. Think of these “satellite offices” as a window into Silicon Valley. You get a direct look at the talent and resources available in Silicon Valley. Perhaps more importantly, they get a look at you, as well. San Diego doesn’t look at Silicon Valley as competition, they look at it as a resource — as should other cities. This way, startups in other cities don’t have to deal with the high cost of operating in Silicon Valley, but they still get the benefit of accessing the massive amount of capital centered there. It’s well known that venture capital talent flows through Silicon Valley like a river; it makes sense to try to tap into that river rather than shift the tide. Indeed, you don’t need to be in Silicon Valley to reap the benefits of what it has to offer. There’s a better solution. Capture the best of both worlds with satellite offices. Satellite offices mean startups in any city have a way to reach out to the talent and capital in Silicon Valley, without packing up and moving out west. Giving companies in other cities a window of access to the resources in Silicon Valley may be the answer as competition gets more fierce. Valuations are out of control in the tech capital of the world, and investors are eager to diversify outside of their backyard. But most investors are not going to go out looking for that opportunity. In fact, for as many venture capitalists as there are interested in investing resources outside of the Valley, many more also refuse to invest in a startup outside of the Valley because of the density of talent there. What that means is you need a strategy so you don’t have to pull them. Go to where they are. Make it easy for them to meet with you and the exciting opportunities in your city. You can make it easier for you to meet with them, and you can make it a lot easier for them to take you seriously. This way, startups in other cities don’t have to deal with the high cost associated with operating in the tech mecca, but they still get the benefit of accessing the money and talent centered there. It’s well known that engineering talent flows into Silicon Valley; it’s also highly competitive, and that makes it an excellent recruitment hub. With this strategy you have access to the venture capital and the talent, combined with the inherent advantages of your home city. That’s a recipe for fertile startup ground, and investors will begin to take notice of the companies with these competitive advantages. The bottom line is this: Silicon Valley is a resource every city should be looking to tap into. It’s going to continue to lead the way and be an investor magnet. By attaching to that magnet, you’re growing the influence of Silicon Valley as well as reaping the benefits of it. A strategy of bridging cities helps everyone. Investors in Silicon Valley get an expanded set of opportunities delivered right to their proverbial doorstep. Meanwhile, your city sees an influx of new talent and investment money, providing a spark to your city’s economy. Bridging the gap, rather than worrying about whether you’re getting the biggest slice of the pie, will help solve the problem of cultivating any city’s local economy. That’s what’s happening as tech startups continue to pop up across the nation. It’s a win-win for everyone.